In this article, you will learn how to create, test and send a campaign from the very beginning, by simply uploading a zip file containing the HTML file you would like to use as your email template along with the relevant image files. Internal name - Descriptive name for the campaign for internal reference. Since this will not be visible to your recipients, you can use this field to indicate the various version of the email (e.g., for A/B testing) or log any other information. Step 3. Click "Yes, go to next step" to move to Content. In this section now you will have to click on the “HTML code” tab. Once you are there you will see 3 options, Rich text HTML editor, Import Custom HTML and Upload zip. See sections below for each of the 3 options. Rich Text HTML Editor - This provides an "MS word" like editor interface for you to start adding or formatting content for your email. You can enter HTML source code directly here by using the "</> Source" button function, which will bring up an HTML template where you write or paste your codes. Once you are finished with HTML code, you will be able to preview the email and make any necessary changes using the Rich editor. Note: We strongly recommend using our default Drag & Drop editor for creating new email templates as oppose to the Rich Text Editor for mobile optimized outputs. Import Custom HTML - This option takes you directly to an HTML source page for you to start customizing your own HTML template. This section is for the people who have knowledge of HTML, CSS & maybe Java language. Here you can create your own HTML coded mailer directly on our platform. After you complete the HTML template, you can preview the result before sending the campaign. Upload ZIP - If you already have a ready-made HTML template and image files, you can package all of them within a zip folder, and upload the entire zip file directly onto ContactPigeon. Click on "Choose File" to select the zip file from your PC directory, and hit "+ Convert" to add the templates to ContactPigeon. The ZIP file will be converted magically to the email for you to preview and send ready. Once you are done with adding the HTML template using any of the 3 options, you can proceed to the next step of selecting target recipients. Step 4. Select recipients for your campaign by checking the corresponding contact lists. 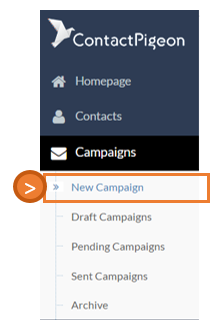 If multiple lists are selected, you can indicate whether if a contact need to be in all selected list in order to receive the campaign (YES) or the contact can be on either list (NO). Step 5. Review your campaign one more time before delivery. Step 6. Set the date and time for when you would like the campaign to be delivered. The default selection is "Send it now" which delivers the campaign as soon as you hit "Send". 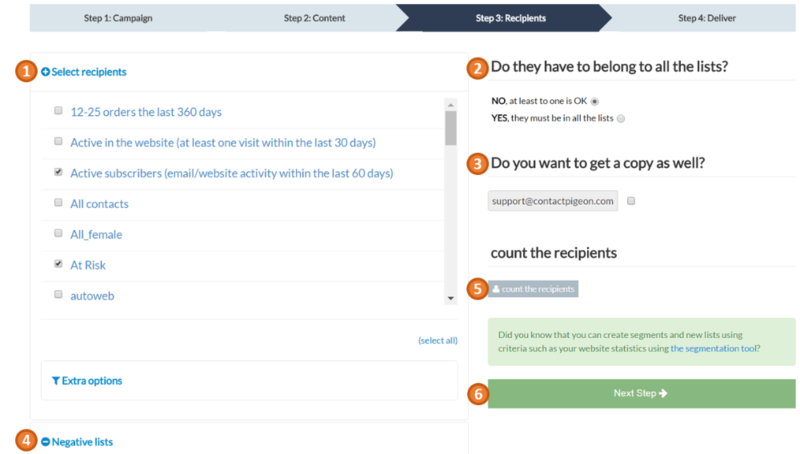 Finally, click "SEND" to confirm your campaign delivery, and the campaign will be on its way.